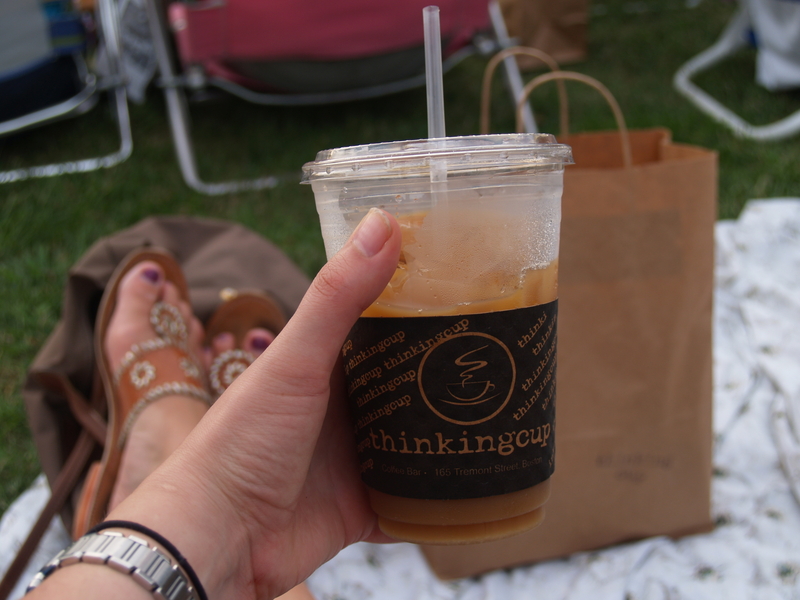 I went to Thinking Cup Cafe the other day before settling in for a picnic and a little Shakespeare on the Common with my friend Dee. One sip of their cold-brewed iced coffee had me begging for the recipe and buying a 12-ounce bag of Stumptown Egyptian Mordecofe, medium grind. I had heard about cold-brew in the past, but never thought to make it myself until my friend Chavi started asking around about it. A quick search online pulled up the 2007 NYT recipe that may indeed have started it all. Where was I four years ago when the rest of the world made this discovery? My excuse – I only get the Times on weekends. Since Thinking Cup’s recipe is scaled to make several gallons of coffee at a time, I opted for the widely available NYT recipe tested by trustworthy Deb of Smitten Kitchen. 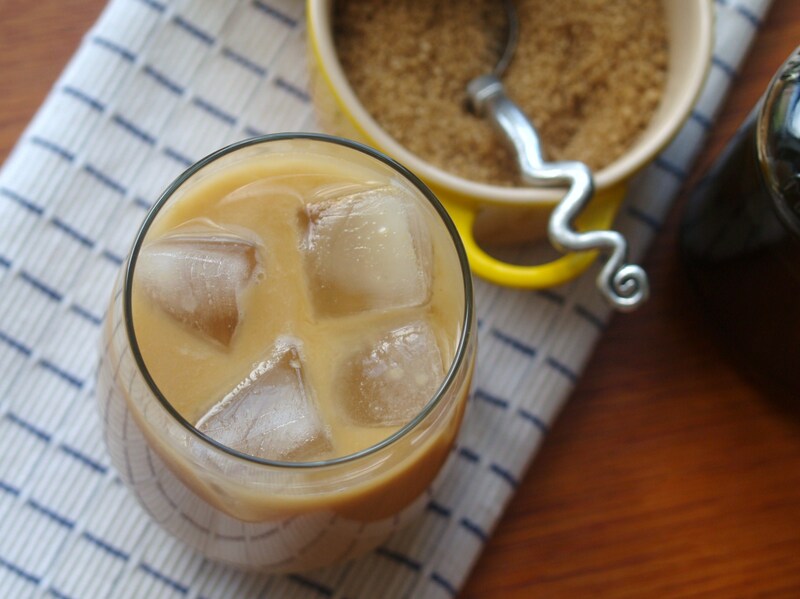 The nice thing about cold brewing is that it isn’t bitter the way hot coffee or espresso poured over ice can be. I’m not entirely sure why that is – does the heat draw out the bitterness? Does the heat draw out good stuff that masks the bitterness? Does anyone know the science behind this? Anyone? Brew. 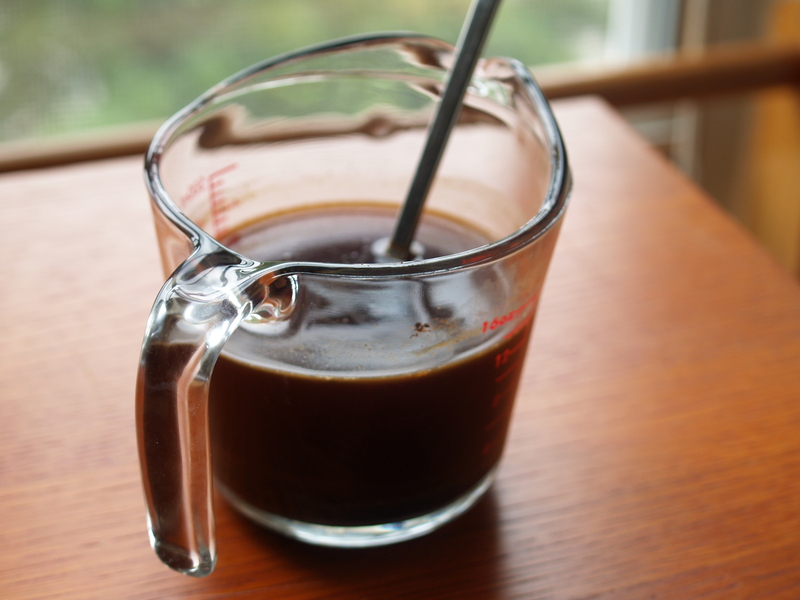 In a jar or liquid measuring cup, add 1/3 C coffee to cold water. Cover and let sit 12-20 hours at room temperature. Filter. Strain through a fine-mesh sieve. This filters out the grounds. Filter again. Strain again through a paper filter this time. This second filter helps remove any remaining sediment. Drink. Pour equal parts concentrate and cold water over ice (or to taste – I like mine pretty strong, so I don’t add much water). Add milk and/or sugar. We found out about cold-brewed coffee from friends we were visiting in NOLA. We even brought back a container of CoolBrew (you can buy it on-line, but it’s pricey because it has to be air-conditioned while being shipped). It took some time to get our act together to make some of our own, but now it’s part of the regular routine. I think re-using the CoolBrew container for our home-brewed version somehow psychologically improves the experience (i.e., just seeing it in the real container fools you into thinking it’s even better than it is). The only thing I still want to try is adding chicory, but it’s just not available in every supermarket, so this might necessitate a trip to Whole Foods. Yum! 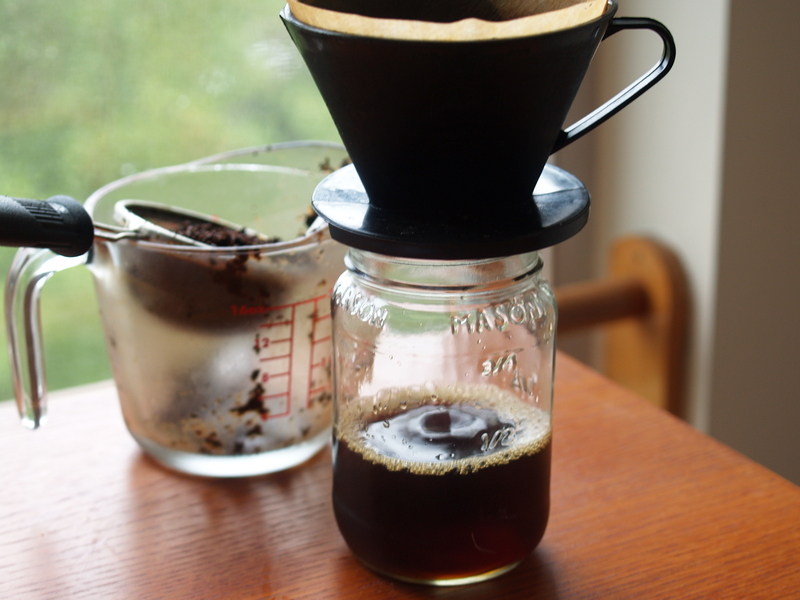 I’ve never made cold brewed coffee. Thanks for sharing the process. – Josh — this is the first I’ve heard of CoolBrew…the placebo effect of putting something in a fancy container is never lost on me! Hmm… I wonder whether one could do the whole thing in a very large French press coffee pot? Once all the steeping is done, just plunge as usual. No need for the separate straining process (I’m all for simple ;-). I’ll give it a try and report back. 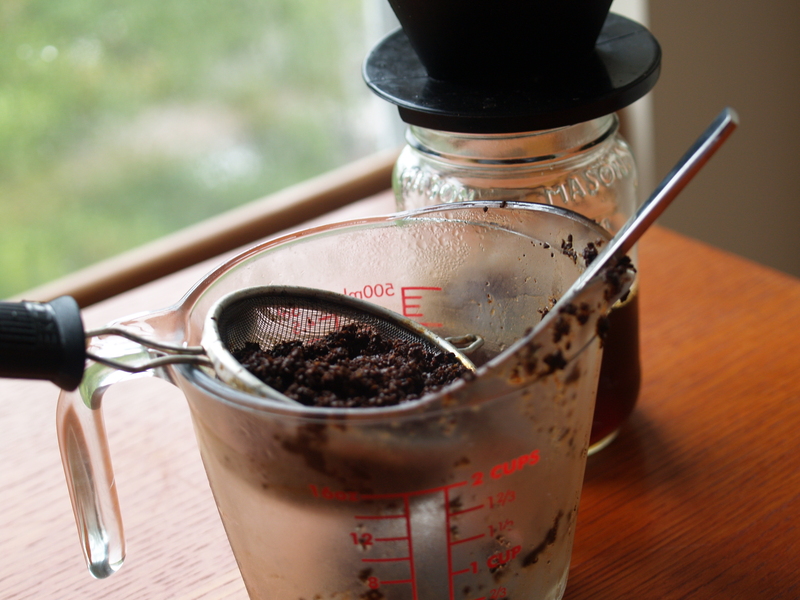 Hi VBB — I have made it in a french press, but still did a single filter to get rid of all the sediment. Let me know how yours turns out.